Extending the cold chain to remote rural areas of Rwanda is a strategy implemented by the Rwandan Government. The Ministry of Agriculture, through the RSSP (Rural Sector Support Program), is committed to the development of innovative supply chains and energy efficient cold storage systems. In the third quarter of 2018, InspiraFarms commissioned ten modular Food Processing and Refrigerated Storage Facilities in six districts across four out of the five provinces of Rwanda. 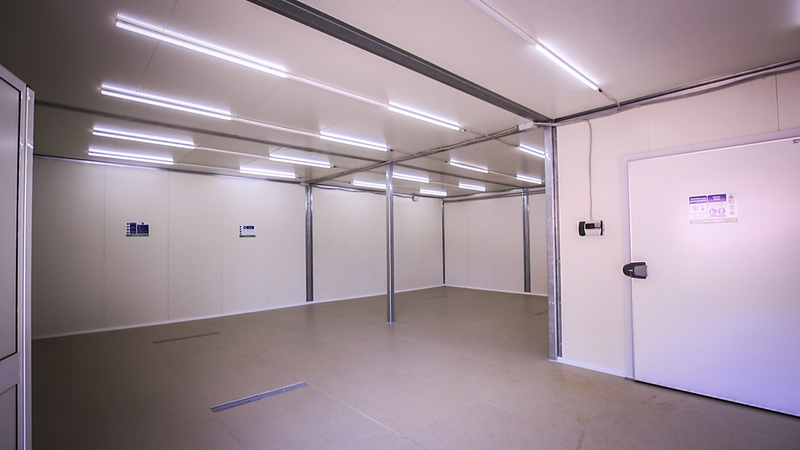 Each facility has a total area of 150 square meters that includes cold storage space, a processing area, an aggregation area, administrative facilities, and hygiene spaces, all running completely off-grid and in compliance with food safety certification standards. Primary processing and handling, and initial aggregation will occur at the community level (cooperative or first aggregation point). The system will give an active role to farmers’ cooperatives in managing the refrigerated storage facilities in the different districts, and will facilitate farmers’ connections to commercial markets and direct linkages with food and export markets. Attacking the root causes of postharvest loss will contribute significantly to improving the lives of millions of Rwandan farmers. By facilitating the use of first-mile distribution refrigerated storage for small-scale farmers, there could be a reduction of up to 40% on farm crop loss.